QUEPOS, Puntarenas – On June 11, 2014, 11 fishermen made history in Costa Rica. In three separate seizures along Costa Rica’s Pacific Coast from Playas del Coco to Golfito, authorities arrested the 11 fishermen who were transporting 4.1 metric tons of cocaine. The operations were carried out with cooperation and intelligence from the U.S. Coast Guard and the Drug Enforcement Administration, and they represented the most illicit drugs ever seized in a single day in the small Central American country. If convicted, the fishermen – currently in preventive detention – could face 20 years in prison for drug trafficking. The average age of the suspects is 32. Because they have their own boats and knowledge of Costa Rica’s infrequently patrolled coastline, Costa Rica’s artisanal fishermen are increasingly becoming targets for major drug traffickers from South America and Mexico, particularly along the Pacific drug-trafficking corridor. Overfishing and low market prices are contributing to the problem, squeezing some 15,000 families who fish with rods or longlines. Several large seizures recently have shed light on a new trend of young fishermen – without prior criminal records – risking their freedom for quick cash by ferrying cocaine or providing fuel and other assistance to traffickers, as drug cartels move their product north to the United States, along the country’s Pacific coastline. Not a month after the historic seizure, on June 30, the U.S. Coast Guard captured another three Costa Rican fishermen and a Nicaraguan man off Costa Rica’s Cocos Island with 2.3 metric tons of cocaine. Cocos Island is an uninhabited island and national park located some 590 kilometers (365 miles) west of the Pacific port of Puntarenas. Its isolation places it right in the middle of a known trafficking corridor. Longline fishing boats tied together on the docks outside the port town of Quepos bob lazily in the inlet’s calm waters. Shirtless dockhands in knee-high rubber boots haul sacks of ice on board the boats that would be leaving the next morning for several days of fishing. Fingers crossed, they will find a school of mahi-mahi – but there hasn’t been a good run in years, many say. Others get stoned in the shade. Many fishermen with whom The Tico Times spoke in Quepos and elsewhere related stories of those who have quit fishing, fallen into debt, or lost homes and boats because of a constellation of factors. Danny Salas, a man whose size would be intimidating if not for his quiet demeanor, has been fishing for red snapper with a small boat since he was 13. “Fishing’s been OK. There might be some fish, but the gasoline is too expensive and that’s what’s affecting us the most right now,” he said while standing under the shade of a dry dock. Salas estimates that his costs have increased 75 percent in recent years. 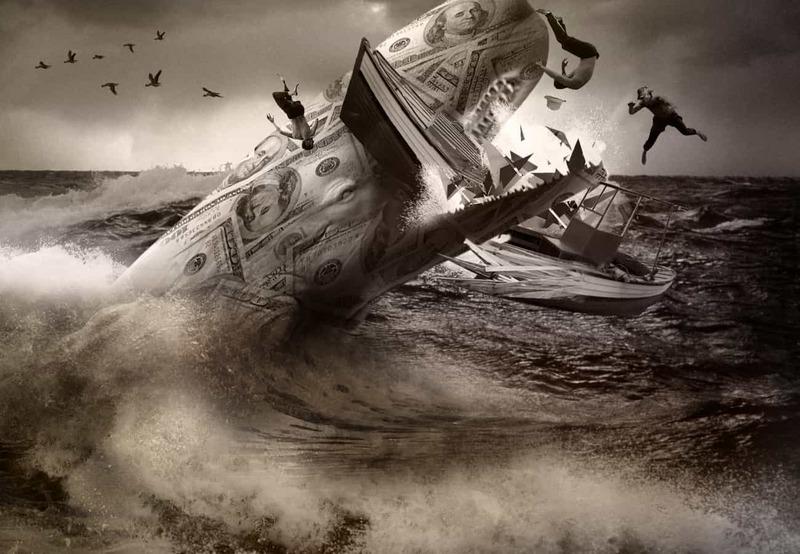 Several years ago, profits from a fishing trip would easily cover the cost of diesel, along with the crew and other supplies. The fixed cost of fuel, though, eats into their meager returns. Many on the Quepos docks complain about the vagaries of what fish exporter Martec Industries pays for their catch. They claim to have no idea what the exporter will pay for their fish, and more often than not, it’s not enough to cover expenses. Jiménez said that fishermen have been paid the same rate for their catch as 10 years ago. Martec did not respond to requests from The Tico Times to comment on their pricing. Some government efforts designed to help struggling fishermen with fuel costs have backfired. The Costa Rican Fisheries Institute, Incopesca, provides fishermen low-price fuel, some of which has been used in drug trafficking activities. Critics of the fuel subsidies allege that Incopesca is inadvertently subsidizing drug trafficking. Another factor is dropping fish stocks. 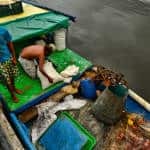 Artisanal fishermen and conservationists allege that industrial tuna fishing operations and shrimp trawlers catch small fish before they can reproduce. “The response has been to fish more, and this has become a vicious cycle, because the resources are no longer providing [as they once did]. The fishing sector is catching 50 percent what it did 10 years ago despite working harder to get more fish. The resources are running out,” Jiménez said. Fewer tourists in recent years because of the global financial crisis of 2008 and dwindling fish stocks also have hurt the region’s sport fishing operations. Yery Picado, who has been taking tourists out to catch and release sailfish for 23 years, said that his business has become so tenuous that he invested in a longline fishing boat, despite the poor prospects. “That way you can at least count on something coming in every month,” he said. Lighting a cigarette in her small home office a stone’s throw away from the ocean, sport fishing business owner Janet Pérez said she has had to cut down the number of tours she offers from three per week to one in recent years. Both Picado and Pérez said that they have had to let employees go due to weaker tourist demand. “Look around, people don’t go out, they don’t spend money. It’s a pressure cooker,” she said. Vice Minister of Public Security Gustavo Mata told The Tico Times he sees drug traffickers’ influence in the Pacific as part of an ongoing social problem. “The lack of jobs, especially in coastal areas, is provoking this group of people to look for a way out. Also, people like easy money so they take the risk, especially young people,” he said. Mata noted that some fishermen have given up their legitimate trade altogether. “The profile of the suspects is very young people without criminal records. Something to emphasize is that now they’re no longer interested in the product [fish] – they bring it back rotten. They no longer go out to fish, they go out for cocaine,” Mata said after a press conference on June 11. Arias estimates that most small boats involved are 10 to 12 meters long and can carry as much as 2 tons of cocaine in the hull’s coolers. Ferrying drugs is not the only way traffickers take advantage of fishermen. David Chacón, president of Coope Tárcoles, a fishing cooperative working in the Gulf of Nicoya, described how some of his members had been approached by drug traffickers asking them to meet in predetermined locations at sea to deliver fuel or other supplies. Arias told The Tico Times that a drug boat traveling from Colombia to Mexico for eventual drug distribution in the United States could require as many as 24 other boats along the way to successfully complete the journey. And sometimes the drugs come to the fishermen. Mariel Soto, whose family owns six longline fishing boats in Quepos, said that one of her captains recently came across several kilograms of packaged cocaine floating in the ocean. Soto said her captain stabbed the packages so they would sink. “If I don’t get rid of it someone else is just going to find it,” the captain told her. Several organizations and the government are taking steps to help fishermen out of dire straits. MarViva, with financial support from the United States Embassy in San José, has been working with fishermen along the central Pacific to combat the influence of drug cartels in the region. 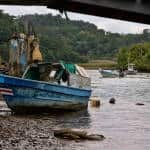 Jiménez said that the Costa Rican Coast Guard’s inability to police all of its maritime territory and the economic vulnerability of artisanal fishermen is a precarious combination. MarViva has partnered with several communities in the Gulf of Nicoya and the southern canton of Osa to form community watch groups to help police the waters and towns where fishermen live and work. Jiménez said that about 200 community members are involved in the watch groups. Nearly half the families involved in those programs earn between ₡100,000 and ₡150,000 a month, less than $300. Another 17 percent make less than $200 a month. Chacón said that drug traffickers could offer as much as $25,000 to fishermen for their help moving drugs up the coast or for fuel. The conservation groups educate local law enforcement and judges about the circumstances in poor fishing communities and try to build trust between police and community members. So far, there have not been any reports of drug trafficking through the watch organizations, Jiménez said, just illegal fishing. 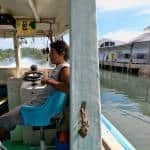 MarViva and some fishing cooperatives have been pushing for more sustainable fishing practices, including excluding industrial fishing boats from near the shore, and vigorously enforcing bans on fishing in designated breeding grounds, as one way to curb the stresses on Pacific fishermen. Artisanal fishermen want President Luis Guillermo Solís’ administration to take action on an unsigned executive decree that would ban purse seine nets, a fishing method preferred by industrial tuna fishing boats, within 60 miles of Costa Rica’s coast. As of this writing, the decree remains in limbo. “The number of jobs needs to go up in all sectors. These people need access to different kinds of jobs [than fishing] and this means a policy promoting businesses, jobs for these people, along with improvements in their health and education,” Jiménez said. Back at the docks in Quepos, Christian Velásquez stands outside the Martec fish market wearing a black Gretchen Wilson T-shirt. Velásquez, who has been fishing for 16 years, said he knows lots of people who have given up on fishing. He doesn’t know how much longer he’ll keep fishing, but in the meantime, it pays the bills. Global drug policy isn’t working. These 100-plus organizations want that to change.